Thank you for volunteering your time to be a trainer this season with CWMH and helping to create a fun, positive and safe environment for our players. It is our hope that the Trainers Hub serves as a resource to all trainers in CWMH. In the Hub you will find the Trainers Handbook, Online Injury Reporting, links to forms, information and articles pertinent to player injury and injury management. As a trainer you will play a vital role in contributing to your teams success this season. Please make sure that you have read the Trainers Handbook. The Handbook will serve as a guide for you this season as it outlines expectations of the trainer as well as answers questions regarding injury, injury management, reporting and return to play protocols for all CWMH players. This season we look to track all player injuries through online and hard copy reporting. This is a new process and with your help and co operation it will allow us to better track and manage injury. The goal of injury reporting is for player and trainer protection, if you have any questions please reach out to the Head Trainer. As we get ready for the season I would again like to thank you for volunteering your time this year. This season I will serve as the Head Trainer for CWMH and am available to you if you have any questions, concerns or otherwise. I wish each and everyone of you the very best of luck this season as we look forward to a fun, exciting and safe season of hockey. 1. Trainers are not to run doors during games. A Trainer should always be watching the play. 2. A Trainer is responsible for player safety at all team events - on and off the ice. 3. 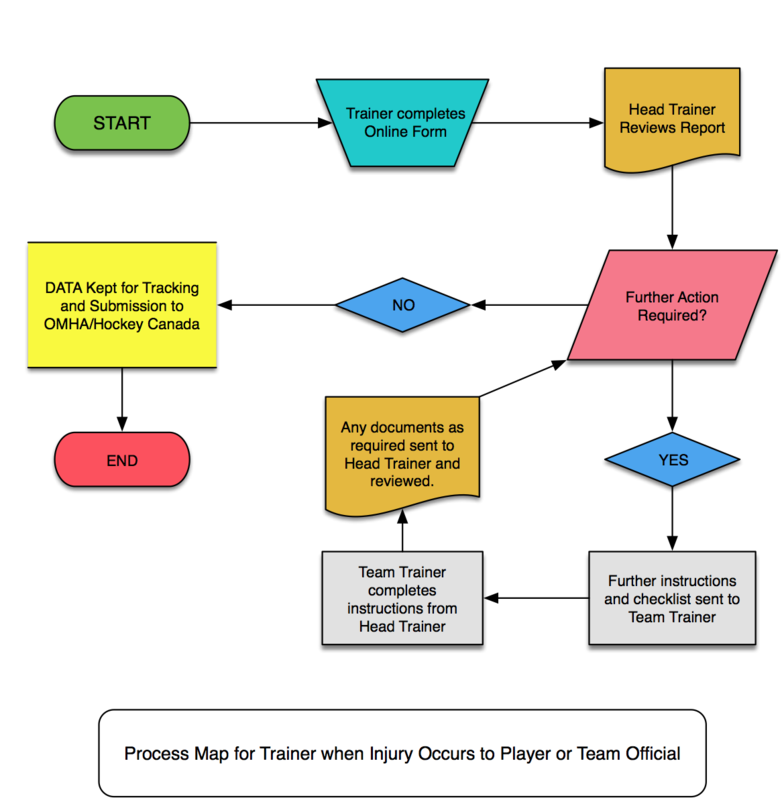 You must have completed medical forms for all players and bench staff at every team ice time or off ice event. 4. All injuries must be reported through the online link bellow. If further action is required you will be contacted by the CWMH Head Trainer. 5. Always err on the side of caution, a players safety is greater than any game or game situation. 6. A Trainer should never be assessed a bench minor or face a suspension - you are here for player safety. 7. An Emergency Action Plan is a requirement. 8. The Trainers decision is FINAL. Please follow the link bellow to access the CWMH Trainers Handbook. It is important that you have a look through the book and understand all expectations, there are timelines and requirements that must be met if an injury occurs. Spare Equipment - Mouthguard's, skate sharpeners ect. Click on the animation above to access the Online Reporting Form. Return to Play Protocol for Concussion. The return to play protocol is gradual, and begins only after a doctor has given the player clearance to return to activity. If any symptoms/signs return during this process, the player must be re-evaluated by a physician. No return to play if any symptoms or signs persist. Remember, symptoms may return later that day or the next, and not necessarily when exercising. Step 1: No activity, only complete mental and physical rest. Proceed to step 2 only when all symptoms are gone. This includes avoiding both mental and physical stress. Step 2: Light aerobic exercise, such as walking or stationary cycling. Monitor for symptoms and signs. No resistance training or weight lifting. Step 3: Light skating and hockey drills (Skate #1) Player can incorporate light off ice resistance/weight training. Step 4: Higher tempo skate, no body contact. (Skate #2) Player may also continue off ice training with higher resistance. Step 6: Game play. (The earliest a concussed athlete should return to play is one week). Never return to play if symptoms persist! A major injury is defined as an injury where a player misses extended time due to an injury excluding a concussion. Examples fractures, dislocations, lacerations requiring stitches. Step 1 : The Player must provide medical clearance (Dr note) before he returns to practice. Player must be cleared for body contact if applicable. The Team trainer must view a copy of the Dr note and the note must be submitted electronically to the CWMH head trainer. Step 2 : The Player must complete 2 skates minimum of 24 hrs apart . If the player plays Minor Bantam or above, the first skate will be non contact and the second skate will be full contact. *The player only requires 1 Dr note total a second note is not required. Advise parents before getting clearance that the note must allow full return to play. 1. A player who has been removed from a practice and does to return or from a game and misses time (a period or more) due to a suspected concussion requires medical clearance (Dr. note) to return to practice or game play. 2. A Player who has suffered a broken bone or major injury that has caused them to miss extended time will be required to complete the Return to Play Protocol for major injury before returning to game play. See 3 & 4 for medical clearance requirements. 3. A player requires medical clearance (Dr. note) to begin the RTPP. The team trainer must see the Dr's note in order for the player to return to practice or game play, viewing note electronically is acceptable. Doctor's notes will be filled electronically by the Head Trainer.